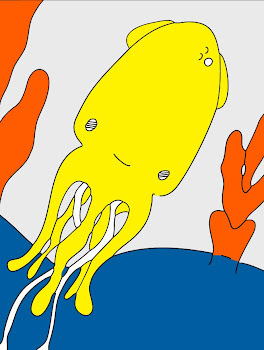 Technicolor Squid: Don’t Hurt Yourself. On this site, laughing is always encouraged. Always! If you were to hurt yourself, however, while you were laughing and pointing at my Matilda doll, well then I would be simply unable to forgive myself. I would find it hard to continue on! So please I beg of you, be careful when you are laughing and pointing. You could accidentally poke an eye out! Scary! Now then, this first Matilda did not work out as well as I hoped. I sewed her on the machine stitch by stitch (i.e. needle up, needle down ... repeat, repeat, repeat ...). Her little limbs were to thin to hold the extra fabric required to turn them and we had a little bit of seam burst-age. It is a shame! She looked cuddly! So back to the drawing board, or photo-copier, as I attempt to enlarge her! *pout* Please send happy thoughts *smile*!